A digital studio at Teesside University is helping a UK innovation centre showcase its facilities to an international audience. 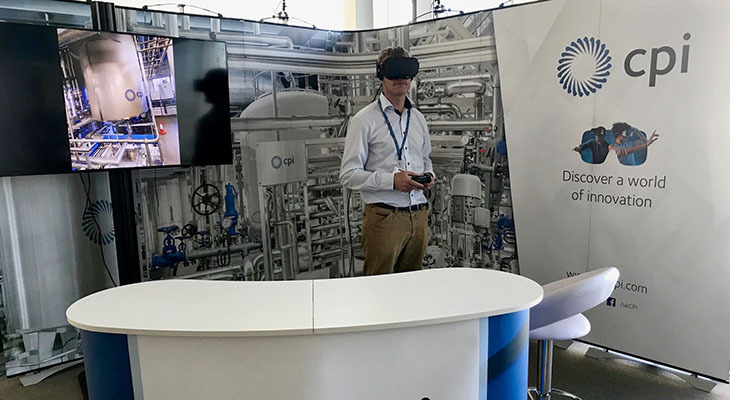 The TUCan Digital Studio has worked with the Centre for Process Innovation, which is based in Wilton, Redcar, to design a 360 degree virtual reality of its world-class Biotechnology and Biorefining facility. The virtual reality tour is being launched at the BIO World Congress on Industrial Biotechnology in Philadelphia, USA, from July 16 to 10.The convention will bring together industry leaders, government officials, and academic researchers to share the latest advances in renewable chemicals, enzymes, food ingredients, biofuels, algae and more. CPI’s exhibition stand will give attendees the chance to experience the scale of the centre’s world-leading Industrial Biotechnology and Biorefining facility. The 360- degree VR tour was completed by Tim Brunton and John Kavanagh in the TUCan Digital Studio, a unique collaboration of Teesside University interns, academic staff and industry partners working together on innovative digital projects in a wide variety of sectors. Associate Dean (Enterprise and Business Engagement) in the School of Computing, Media & the Arts, Siobhan Fenton, said: 'We are delighted to have been able to lend our expertise to this exciting project and enable CPI to showcase its world-leading facilities here in the Tees Valley to an international audience. 'Biotechnology is one of the growth industries in the Tees Valley. CPI’s Director of Industrial Biotechnology and Biorefining, Kris Wadrop, will be representing the organisation during the conference panel: ‘Scaling to Commercial: Unlocking the Value of Digital Biology’. Informed by his vast experience of taking technology from concept to pilot scale, Mr Wadrop will explain how CPI’s state-of-the-art C1 gas fermentation facilities are well placed to meet the industry’s requirements, and how CPI’s expertise can help overcome the challenges of scaling-up in industrial biotechnology. 'At CPI, we’re perfectly positioned to facilitate this incoming field, and I’m very excited to be able to share our world-class expertise and state of the art approach at BIO World Congress,' said Mr Wadrop.